Smartphones and tablets have grown tremendously in the last couple of years but while that’s all obvious now, a couple of years ago traditional PCs still seemed to have a steady growth pattern. Not anymore. PC sales have slowed down to zero growth (and some PC makers are in decline), a shift that is causing tectonic changes in the industry. And the biggest deal that is about to happen is Dell going private as its founder Michael Dell is taking matters in his own hands in a desperate effort to bring the PC maker back on its feet. Dell is buying out the company from shareholders with the help of Microsoft in what is a massive $23 billion deal. Shareholders still have to approve the deal, but if they do it will become the biggest transaction of such kind since the financial crisis began. What is interesting however from our standpoint of smartphone and tablet watchers is the fact that Michael Dell has now openly admitted one of the biggest reasons for the decline of the company he started from his parents’ garage nearly 30 years ago. "I didn't completely see that coming," Dell said adding he did not expect to see business adopts tablets in lieu of PCs so quickly. 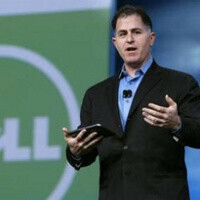 Dell certainly needs the freedom to make radical changes at the company he started. While we don’t know what will be his move in this post-PC world, the company founder is known for his attention to minute details which should translate into great products. Time will tell if our guess is right. I sure hope they learned a lot from the Dell Streak. Thanks Apple for the tablet Boom, I always wanted one since I was a kid. That is all, take your billions and let every one else do the job right. I'm a huge MS fan but I think it's time MS got a reality check with the price of their OS. Not only to them but Intel for the Price of their procs as well. We are in an age where people want cheap devices to consume content while still being able to do real work. The Surface is PERFECT for this. The problem? Price! It's the same across the board with every Windows Tablet. Now that the price is up to normal for Win8 I don't see those prices dropping. Give the OS away(cheap). Make money on the marketplace! Save the PC Industry! He can blame tablets if it helps him rationalize his declining business but the reality dell took its eye off the ball many years ago. Speaking as a dell partner and customer they have become increasingly bureaucratic and difficult to work with over the years, to the point we now just buy used gear on eBay as the purchasing experience is that much better. Dell used to be an awesome company, they aren't anymore and that's a big part of what's hurting them. The people we used to work with there are the first to admit it.